Recently, we told you about the upcoming release from Big Head Todd & the Monsters’ bluesy side project – what you might call the Dr. Jekyll to their Monster persona – the Big Head Blues Club, a follow-up to the club’s 2011 Robert Johnson tribute album that, this time around, focuses on the music of one of the most prolific songwriters in the history of the blues in the great Willie Dixon. Kicking off on a swinging, horns-laced “Hidden Charms” that nicely captures the song’s original magic, the band follows up with a quickened, keys-drenched and slightly funky take on “The Seventh Son”, sounding like they’ve been performing these songs on a nightly basis for years. Though the Monsters seem to do just fine on their own, with lead singer Todd Park Mohr’s fluctuating voice working particularly well on songs like “Hidden Charms” and the closing, slow shuffling “Sittin’ and Cryin’ the Blues”, the addition of several special guests helps give further diversity and authenticity to the project, with Mud Morganfield (son of McKinley Morganfield, who most know by the stage name of Muddy Waters) lending his deep, very Muddy-ish vocals and terrific laugh on an upbeat “You Need Love” (from which the album’s title of Way Down Inside derives) that starts out creeping and then picks up to a rocking tempo, and a swaggering “I Want to Be Loved”, both also featuring Chicago bluesman Billy Branch on harmonica. Branch also jumps in on vocals for a shuffling “Bring It on Home” that isn’t quite Zeppelin’s version but offers some nice energy of its own, and a creeping “It Don’t Make Sense You Can’t Make Peace”, which happened to be Dixon’s personal favorite of the hundreds of songs he wrote during his lifetime. In addition to contributing additional guitar on nearly all of the tracks, Ronnie Baker Brooks (another second-generation bluesman as the son of guitarist Lonnie Brooks – that’s Lonnie’s, Ronnie’s, and Ronnie’s brother Wayne’s hands playing each others’ guitars in the picture that appears at the top of our site!) handles lead vocals on a soulful, horns-accompanied “Let Me Love You Baby” and patient, partly falsetto “My Love Will Never Die”, with Mohr, Branch, Brooks, and Morganfield each taking a turn on the mic on “Good Advice”. Erica Brown adds some powerful (think Koko Taylor-ish) female vocals to her duet with Mohr on the slow, empassioned blues of “The Same Thing”, which also includes some tough licks on guitar and harmonica in addition to its rich keyboards. The band rounds off the set with a whistle-filled “Pretty Thing” that’s set to a Bo Diddley beat and an upbeat “Crazy Mixed Up World” that features some crazy good harmonica from Branch. With just the right balance of focus on their guests and on the Monsters themselves – every bit of it a joy – Way Down Inside makes for a superb tribute to one of the true giants of the blues, as we imagine each of the dates on the Club’s tour that started this past weekend in California will also be. 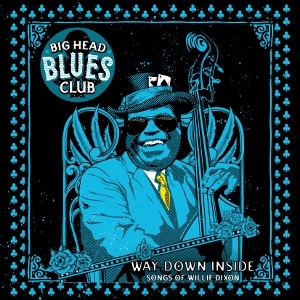 With now two solid tribute albums under their belt, the Big Head Blues Club is one you’re going to want to be sure to catch! This entry was posted in Albums and tagged Big Head Blues Club, Billy Branch, Mud Morganfield, Ronnie Baker Brooks, Willie Dixon. Bookmark the permalink.